The world is full of different types of people with all sorts of different interests. Some have a hankering for old-timey cartoons featuring exaggerated characters and crazy dance routines. Others on, let's say the total opposite side of the fence, enjoy the more sinister thriller of psychopathic stabbings. It's pretty uncommon that you can find one character who can test the waters with both of those audiences. But, given enough time, all things are possible. Such is the case with Pin-Up Girl from The Strangers. You never know what you've got with this gal! See if your friends are more killer or comedy with this Pin-Up Girl Vaccuform Mask from the slasher film, The Strangers. 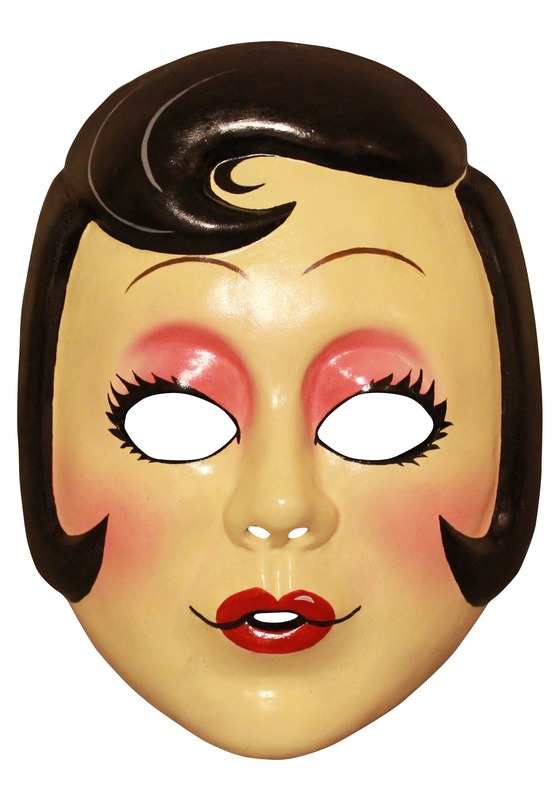 This plastic mask is styled with a '50s look complete with the dolled-up hair, blush, and bright eyeshadow. There are holes for breathing and vision, so you'll have a full view of your friends' reactions when they see you knock on the door. Everyone recognizes the horror masks of Freddy and Jason, but who is expecting the creepy killer that is Pin-Up Girl? Well, when they answer their door to see your cheerfully masked face, you might see a wide grin or freaked out fear. Just make sure you ask if the right person is home!